In the words of a Christopher Nolan antagonist, “And here. We. Go!” The fall season kicks off in style with two of the biggest profile and most-anticipated films of the year, although both have factors that may limit their opening box office slightly. 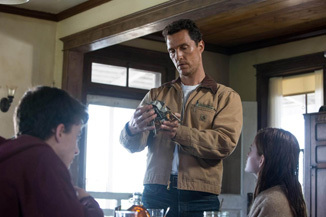 Let's start with the film that's getting a small jump on the weekend, Interstellar. Directed by Christopher Nolan (who after Insomnia and Inception, appears to be trying to monopolize the 'In-' portion of your movie library), it's a science-fiction story set in Earth's near future, with environmental damage wreaking havoc on society. After the discovery of a nearby wormhole, an ambitious project is launched to send a spaceship through it to find a new habitable world and ensure the survival of the human race. Pilot Matthew McConaughey is tasked to lead the mission, at the cost of abandoning his young family. Save the human race or be true to your family: this sounds like the ultimate Christopher Nolan dilemma, perfectly calculated for his “all head, little heart” filmmaking style. It's also as epic a story as it gets, filled with notions of what makes us human, why our drive to explore is crucial to survival, and how we can also be our own worst enemies. The hope is that this is a Contact for this generation, full of the wonder of space travel and discovery.